For as long as we’ve done it (forever), for as often as we do it (a third of our lives), we actually know very little about sleep. While the science of why we sleep remains up for debate, we do know that how and when we sleep has changed over history. It’s fair to say that despite the biological need for sleep, it is susceptible to the influence of social and economic circumstances, technology and trends. Plenty of historical evidence reveals that humans used to sleep in two distinct segments over the course of a night. In 2006, historian Roger Ekirch published At Day's Close: Night in Times Past, in which he discussed the findings of his 16-year research on sleep. In the book, Ekirch references evidence from over 500 sources, including diaries, court records, medical books and literature, from Homer's Odyssey to an anthropological account of modern tribes in Nigeria, that indicate the widespread, centuries-long pattern of “bi-modal” sleep amongst humans. According to Ekirch, the sources reference bi-modal sleep as though it was common knowledge, the norm. In bi-modal sleep, people would go to sleep about two hours after dusk. About four hours later, they’d wake for an hour or two. Some were active, visiting neighbors or smoking tobacco. Others would meditate, pray, reflect or write. Then they’d go back down for a second sleep of around four hours. References to two sleep chunks grow less common by the late 17th century. The reason? Lighted streets. In 1667, Paris became the first city to light its streets, using wax candles in glass lamps. More than 50 European towns were lit at night by the end of the 1600s. This meant night was no longer the dominion of the imprudent, the immoral or the criminal. All-night coffee shops began to open up. Night became fashionable, particularly for the upper class, as they could afford to light their homes at night by candle or gas. Lying in bed all night was becoming perceived as a waste of time. After not too long, bi-modal sleep was traded for partaking in legitimate nighttime activity. Eventually, socializing at night became typical, regardless of one’s economic status. Consequently, more people were going to bed later and sleeping in just one session. By the 1920s, Ekirch determined that two sleeps were completely obsolete. By the 20th century, sleep officially began to get a bad rap. Thomas Edison, who supposedly slept less than four hours per night, wrote, “Sleep is a criminal waste of time and a heritage of our cave days.” Margaret Thatcher famously got by on only four hours of sleep per night, reportedly going so far as to say, “Sleep is for wimps.” Bill Clinton was known to sleep only five or six hours a night during his presidency. The story goes, while Clinton was in law school at Georgetown, a professor who repeatedly said great men require less sleep left an indelible mark on him. Did this idea that sleep is for the weak lead to a reduction in how many hours Americans sleep on average? Perhaps in part. Because something did. Sleep is notoriously challenging to track. 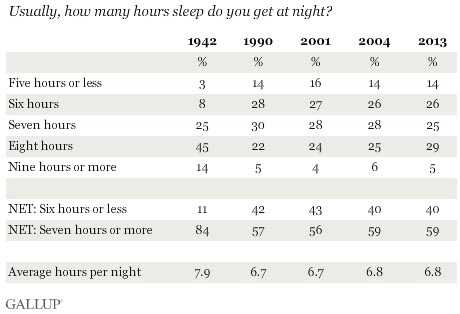 But according to a 2013 Gallup survey, we sleep nearly an hour less per night than we did in 1942. This is likely a consequence of multiple factors. Since the 1940s, far more Americans, particularly women, have jobs. TV came along and probably stole some sleep. Then eventually we could take laptops and smartphones into bed with us. Getting a solid night’s sleep is slowly becoming fashionable again. Largely due to some new research that shows how critical sleep is to good health and how destructive too little of it can be to our health. Even Bill Clinton, chastened by his quadruple bypass, has changed his tune on sleep. In this TLV, we’ll take a look at what we know about sleep, what we don’t know and how to get more of it—even if that means sneaking a nap at work (and science says you should!). We do, at least, know this: The next time you find yourself sleepless in the wee hours of the night, don’t stress. Get up, read, write and give a nod to your ancestors, who very likely were doing the same at that hour, hundreds of years ago. The last few days, equity markets around the world have taken us up, down and all around. Fear of China’s economy slowing down has made more and more investors nervous about the future. There is good reason for this fear, as China has been a primary driver of the global economy over the last three decades. But China is not about to implode. They are just transitioning, just moving from one part of the economic lifecycle to another. What we are witnessing is China beginning the shift from an infrastructure- and production-oriented economy to one that will be more consumer and service oriented. They are moving from a brute force economy to more of a finesse economy. This is not all that different from what has occurred in other emerging economies that became global leaders – the US and Europe being prime examples. China had to build an infrastructure to support a more modern way of life for its citizens. They needed to build power plants, railroads, ports, telecommunications, housing, urban utilities and many more pieces of modern life that developed economies already possessed. Their execution of this “rags to riches” development was accomplished in astonishing fashion and speed. Have we seen anything similar from South America or Africa? How about a big hooray for what China has accomplished rather than the “told you so” coming from the China bears? Infrastructure development in a market-oriented economy does not happen without waste and excess. Just look at the US telecom and natural gas markets of the 1990s. Anyone remember the name WorldCom? Or how about Enron? These are two examples of the messiness market economies create when they go through significant changes. In the case of WorldCom, they built more telecom lines than the world needed…at that time. It didn’t take too long for enormous overcapacity in the global fiber optic network to find uses. Enron was the child of deregulating energy markets in order to make them more efficient. Lessons learned from Enron’s collapse helped ensure that energy markets did become more efficient. The lesson to learn as we watch China’s economic transition is that market economies are not immune to volatility. The fact that volatility exists may actually be an indication of a healthy market economy environment. Our real challenge is fear of failure. If we act too much to reduce failure, we move a market economy out of its most productive state. On the surface, the employment/unemployment situation in the United States has improved measurably since the 2008/2009 financial crisis. At the same time, though, there has been much debate over the quality and the quantity of employment. Many have rightly pointed out that most employment growth has been coming from lower paying jobs. This could be, at least in part, a natural reaction to how government has set up and is supporting our economy. To date, our recovery from the financial crisis has been driven mostly by government stimulus, particularly monetary stimulus. This has provided Wall Street and the financial industry significant operating leverage. Fortunes are being made by moving money around, and because there is very little need to invest in assets while making financial profits, those profits can trickle down to more consumption. It shouldn’t be a surprise, then, that jobs in services and the consumption of products are growing fastest. This could explain the significant growth in retail, restaurant and consumer services employment, all of which are lower paying. If we want to create more higher paying jobs, our economic policy needs to be more supportive of the production part of economy. It also seems odd that the Bureau of Labor Statistics counts a part-time job the same as a full-time one. Can a country full of part-time workers be as economically successful as one full of full-time workers? The answer to this question seems obvious: of course more full-time workers is preferred. Right? Maybe not. Huh? As one of the New America links below suggests, the nature of work in the country is changing. We hear and read about the share economy consumption model. What if the same is happening to employment, where sharing employers—working freelance or as a consultant for multiple companies—is becoming more natural? Gone are the days when we need people to work an entire career on the assembly line. Here are the days where we need more and more people with greater flexibility in knowledge, work and skills. One day robots are going to be making all our stuff, so what are people going to do? To survive, we may all have to become consultants. And in order to maintain our personal economic viability, we may have to improve our personal substance-over-form value proposition. That which doesn’t kill us makes us stronger. So in a way, the share employer job model may ultimately make all US workers much more capable. Necessity is not just the mother of invention, it’s also the mother of get up and get after it. If you don’t make things happen, then expect things to happen to you. People who wake up every day with the desire to create and/or learn something new have much more control over their lives. Bad things may happen to bad people, but they may also happen to people waiting for the phone to ring rather than going out to create some new value someplace. So much of life is about attitude, and a desire to advance one’s knowledge and contribution is the greatest attribute of personal sustainability. 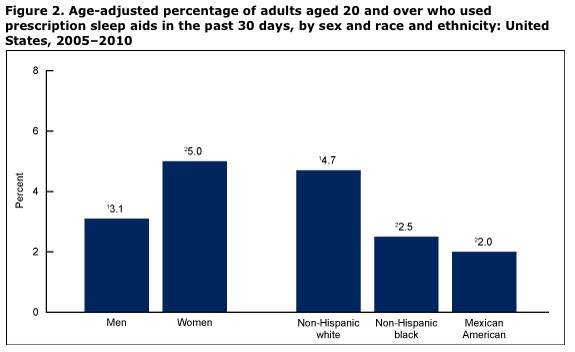 From 2005 - 2010, the Centers for Disease Control and Prevention conducted a comprehensive sleep aid use study and found that 9 million Americans pop sleeping pills in an attempt to sleep. Given their addictiveness and link to disease, this isn’t a great sign. It was found that frequency of sleeping pill use increased with age and education. Data also showed variance in use along gender, racial and ethnic lines, as depicted in the following chart. Follow the link or click the chart for the full report. 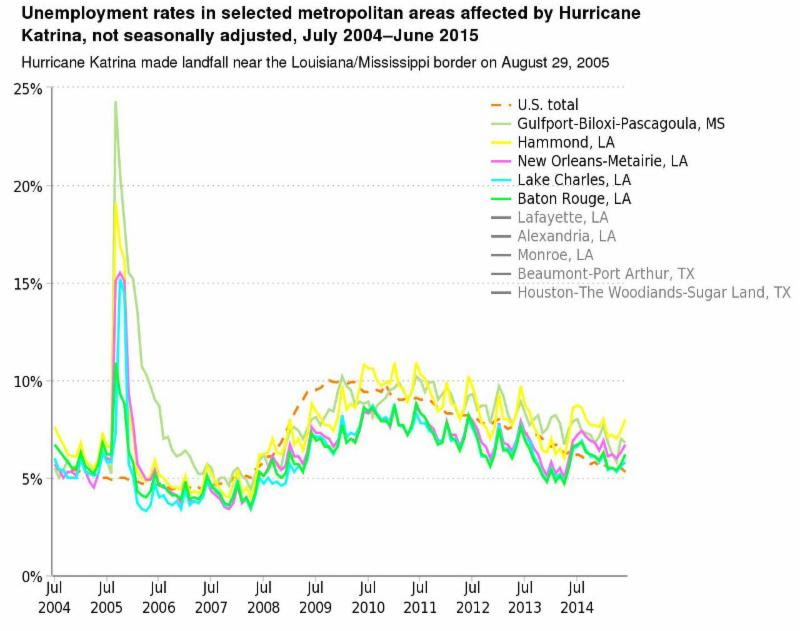 Ten years after Hurricane Katrina, the BLS took a look at unemployment in the hardest hit regions. In the immediate aftermath of the storm, the most devastated counties in Mississippi and parishes in Louisiana saw an immediate and precipitous spike in unemployment, rocketing to nearly 25% in Mississippi. By spring 2006, most affected counties and parishes had returned to pre-hurricane employment levels. As of June 2015, employment in all counties and parishes in question lagged behind the rest of the country. Click the link or map to access an interactive version of the map. TED Talk: Why do we sleep? Restoration: This theory, which tracks back to Aristotle, is back in fashion, with new evidence that certain genes only turn on during sleep. Energy conservation: In this theory, we sleep to save calories. But data shows when we sleep, we only save 110 calories (about a hot dog bun), which to some disproves this hypothesis. Brain function: In this theory, we sleep for brain health and processing and memory consolidation. Foster prefers this third theory, noting that research has found that the sleep-deprived struggle to learn a new task. More interesting to Foster is that sleep has been shown to enhance our ability to come up with novel solutions to complex problems. Data shows sleep gives us a three-fold advantage in creativity. Watch the video for more insights from new research of sleep and cognition. Neuroscientist Jeff Iliff looks at new research supporting the idea that sleep is an “elegant design solution to some of the brain’s most basic needs.” Brain cells, like all other cells in the body, produce waste. Outside of the brain, this waste is cleared by the lymphatic system. So how does the brain, which has no lymph nodes, clear its waste? Watch the video to learn about a new and significant discovery that revealed a “specialized network of plumbing” that links the brain to the lymphatic system. During sleep, this network of vessels activates to clean and drain the brain of waste, which is critical for healthy cognitive function (and could lead to some promising breakthroughs about neurological diseases like Alzheimer’s and MS). In 2014, the CDC declared sleep deficiency a public health epidemic, citing a link between lack of sleep and motor vehicle crashes, industrial disasters and medical and other occupational errors. The report’s data revealed some interesting differences along racial and ethnic lines. The Freakonomics guys got curious: Can the health issues caused by deficient sleep impact individual economic outcomes? 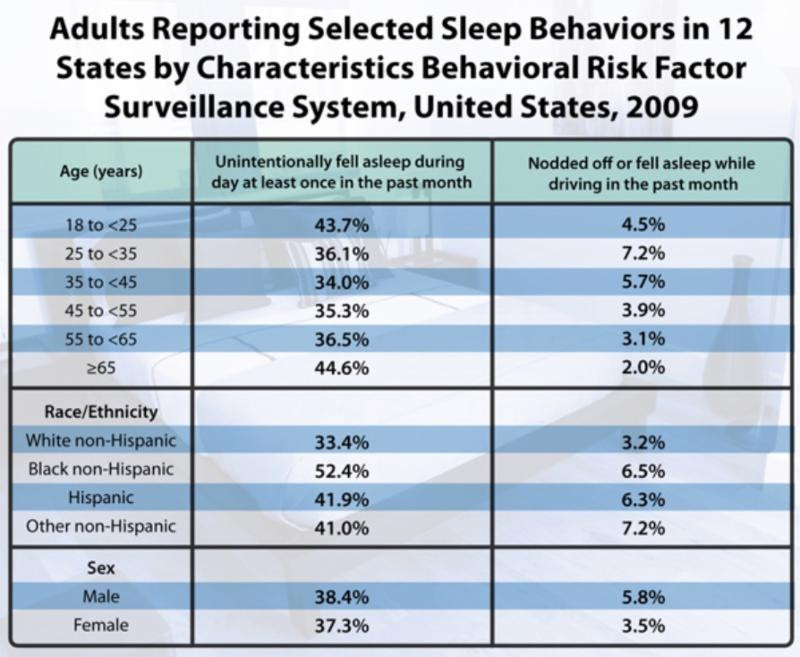 And what role, if any, might race or ethnicity, play in quality of sleep and economic outcomes? In this fascinating two-part series, the hosts look at sleep from a number of socioeconomic angles and discuss some insights from recent sleep research. Click here for Part 1 and here for Part 2. What the heck is “sleep hygiene”? It’s all your habits before and around sleep. Researchers from Harvard’s Division of Sleep Medicine created a list of 12 tips for superior sleep hygiene. Perhaps the most important? Following through on your commitment to sleep hygiene. Was Margaret Thatcher bluffing about her minimal sleep? A sleep study of 100 pairs of twins found that some people do have a gene variant, dubbed the “Thatcher gene,” that allows carriers to get as little as five hours of sleep and maintain the same level of cognitive function as those who sleep the suggested seven or more hours. The study reinforces general consensus that sleep is biological, not preference. Scientists have honed in on a gene that, depending on the variation in an individual, may influence one’s tendency to wake earlier or later by as much as an hour. As discussed in the Freakonomics podcast, the world is structured to benefit early risers. Brain scans of people at various points of the sleep-wake cycle revealed “diminished integrity” in the brain’s white matter of night owls, which is linked to depression and disruptions of normal cognitive function. One theory? Night owls suffer from “social jet lag,” a misalignment of biological and social time, or what happens to night owls who are at constant odds with a social structure that favors early risers. Time for night owls to unite! Snorers can be a nightmare for those with whom they share a bed. And solutions remain elusive. A study out of Brazil shows some hope for snorers who engaged in three daily sets of “equipment-less, oropharyngeal exercises.” Read on to learn how to do the exercises and potentially snore 36% less and see significant decrease in snoring volume. 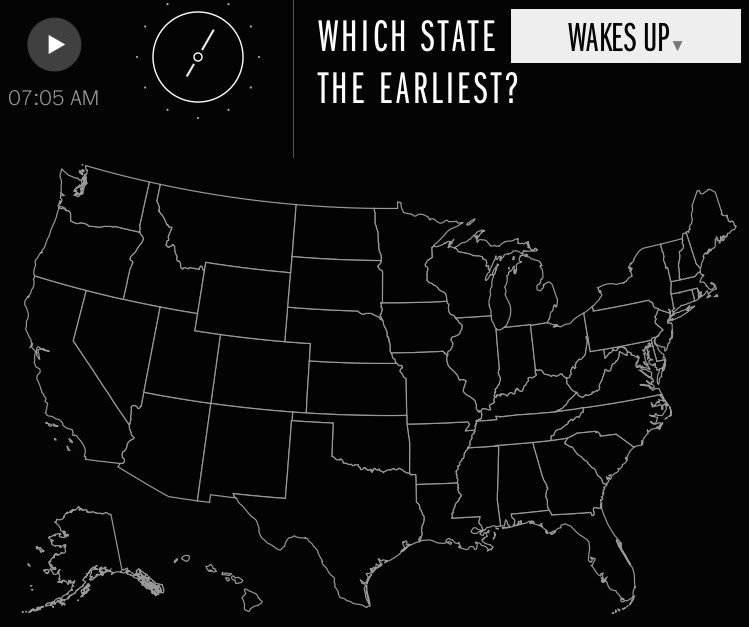 Time magazine’s Time Labs: How do your sleep patterns compare to the rest of America’s? Despite a 5.3% unemployment rate, which Gallup’s CEO famously called a “big lie,” other important indicators point to a still struggling job market. The left-leaning Center for Economic and Policy Research recently found that the portion of the prime working-age population, 25 to 54 year olds, with jobs is 77.1%. This is an improvement from the 2010 low of 74.8%. But it hasn’t rebounded to its December 2007 level of 79.7%. Focusing on the prime working-age group, which excludes those of retirement age and those more likely to be in school, is more indicative of what’s really happening in the job market. Which countries hold what portion of the world’s $59.7 trillion in sovereign debt? 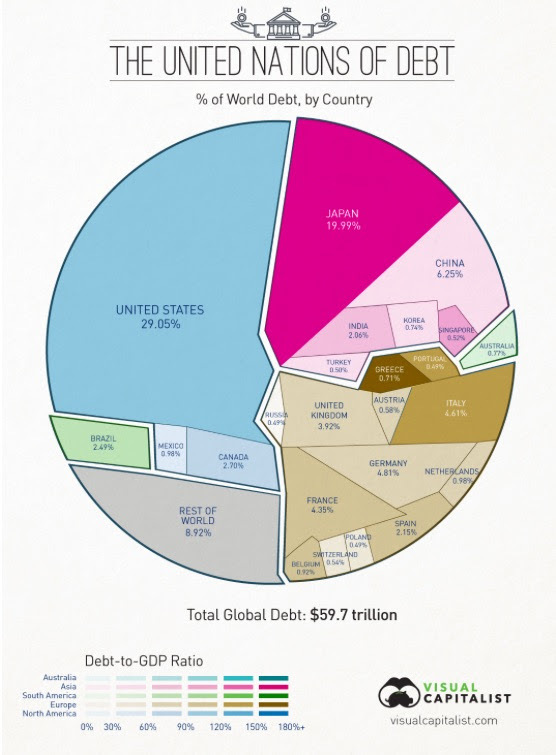 The US constitutes 23.3% of the world economy but 29.1% of world debt. Its debt-to-GDP ratio is 103.4% using IMF figures. Everyone needs honest and constructive feedback to grow and evolve as an employee. Yet delivering productive feedback is notoriously challenging, and most leaders and managers either go for too much compassion or too much honesty, both of which are unproductive. What’s the secret to real and direct feedback, without putting the recipient in fight-or-flight, defensive overdrive? Read on for a practical plan for giving productive feedback. On that note…First rule of feedback: Don’t shirk. Shirking means not taking ownership for tough feedback and placing blame elsewhere, which will almost always backfire, diminish your leadership and contribute to a culture of blame. Taking ownership of constructive criticism is the only way to exhibit strong leadership and help your employees grow and achieve great things. As the presidential election gets underway, and promises to be an…interesting one, here’s a look at how the voting population has changed since 1984. Follow the link for additional data on the electorate then and now. The New York Times takes a look at how modern creatives are cobbling together careers and income through a hodge podge of gigs and projects. They’re also changing the rules of employment and navigating the workforce in a way that wouldn’t have been possible just 15 years ago. Read on for yet one more indication that the norms of how we worked in the 20th century continue to get upended in the 21st century, technology-driven economy.